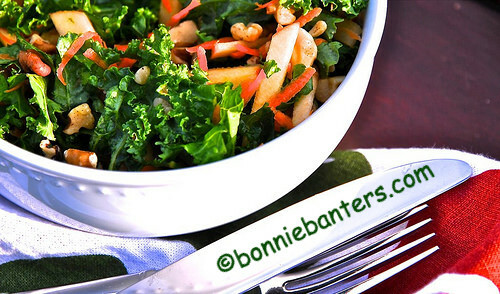 Bonnie Banters: Fall Harvest Kale Salad with Slivers of Apple, Toasted Walnuts and A Unique Blue Cheese Dressing! Whisk all the ingredients together, gently stirring in the blue cheese last. It is better to refrigerate at least 4 hours or overnight to let the flavors meld. Gently toss together the all the ingredients for the salad. Add the dressing right before serving. For an easy way to toast nuts, see my Pull-Apart Bead with Pumpkin Pie Spice Filling and Glaze and Toasted Pecans. Salt is not needed because the blue cheese is salty enough. You'll feel like Autumn has truly arrived when you enjoy this simple, scrumptious and hearty salad! By the way, did you find the unique ingredient that adds the perfect dimension to the dressing for this salad?